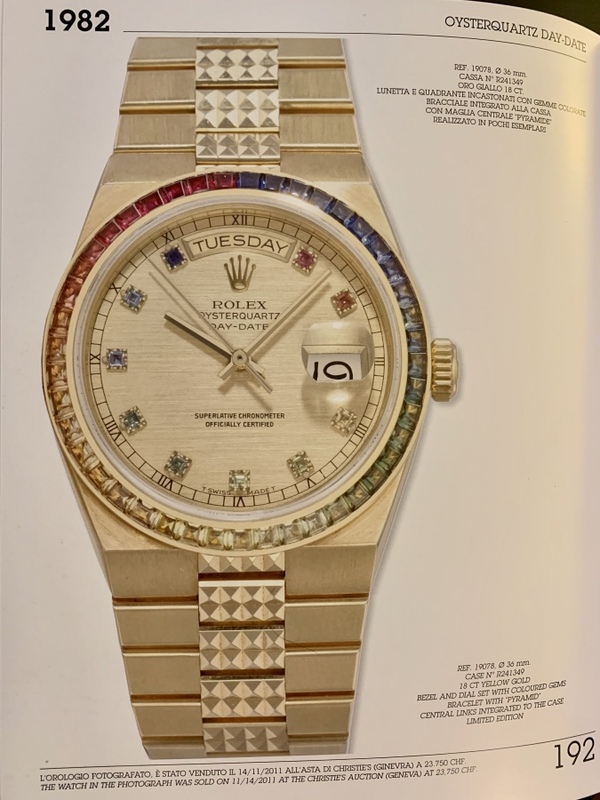 The OG RBOW | Contravex: Essais de Pete D.
After John Mayer’s successful return to Talking Watches,1 not to mention the nearly concurrent release of the Rolex Day-Date 36 Rainbow ref. 128345RBR at Baselworld 20192 (which was itself on the heels of the too-hot-to-handle Everose Daytona Rainbow ref. 116595RBOW in 2018),3 multi-coloured-and-bejeweled references are enjoying something of a resurgence in popularity for both men and women. Case in point amidst all this rainbow fever ? Don’t forget to read the footnotes. And take your Vitamin D! Oh, those Greeks! They knew how to live: for that purpose it is necessary to keep bravely to the surface, the fold and the skin; to worship appearance, to believe in forms, tones, and words, in the whole Olympus of appearance! Those Greeks were superficial – from profundity ! Colour-matching a smoothly transitioning gradient of sapphires into a seamless rainbow ring like the ones on these bezels is not only incredibly labourious but also requires the most talented gem-setters and gemologists in the world supplied with the absolute highest quality stones. As such, only about 200-250 of each of the YG and WG Rainbow Daytonas were produced over the course of 3ish years of production, and probably only a few dozen of the RG are currently in the wild a year after their official release. It’s a rare bird, this. The last one to sell through at auction was at Christie’s in 2011 for 23`750 CHF. The one put up at Philips in 2017 didn’t meet reserve. Their current value ? Anyone’s guess but surely trending upwards with the rest of the rainbows. Tasteless ? What’s “taste” anyways ?